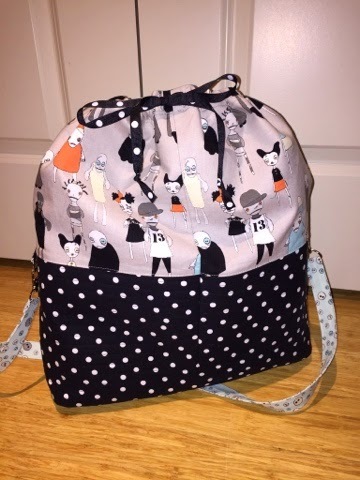 I was recently given the opportunity to review the Doris project bag designed by Reene Witchard of Nellie's Niceties. (In the interest of full disclosure, I was provided with a copy of the pattern by the designer, but the opinions expressed below are fully mine - for better or for worse.) 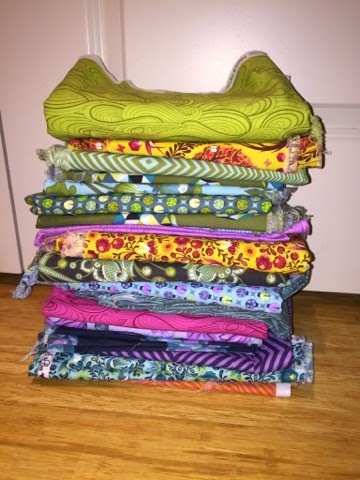 The timing was pretty much perfect because I needed a bag to hold the fabric that I've gathered for the Tula Pink Space Dust quilt that I am planning to make soon. While the bag is really designed for yarn-based projects, at 18" x 16" x 6", it is nearly the perfect size to hold all of my special fabric for my Tula project (all of it except for the 5 yards of background fabric). I'll be honest, I don't think the bag photographs especially well (and my lack of photography skills don't do it any favors). It's a very cool bag. top/lining and a black and white dot for the bottom. The pattern is very flexible and written to so that the sewist can make their bag more scrappy (as shown on the pattern cover) or less so (as I have done). You also have the option of adding a pocket to the front (the pattern lists both open and zipped) as well as an optional detachable shoulder strap. You can also add a fabric covered elastic loop on the inside. I opted for no pocket or elastic loop, but I did want to add the shoulder strap. As with most other patterns, the additions do increase the amount of fabric required. 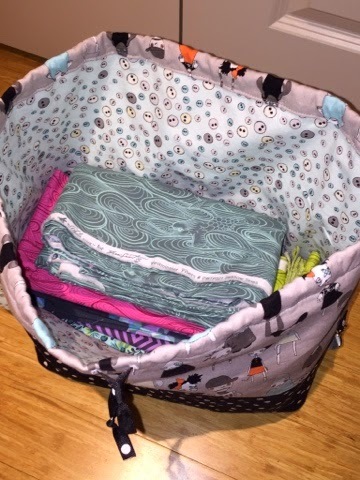 The simple Doris bag (no strap or pocket) requires 3/4 yd of fabric for the lining and just shy of 3/4 yd of fabric for the 3 outside pieces (base of bag, upper exterior, and lower exterior). I found a cute black and white ribbon to match my fabric for the drawstring closure. I did find several aspects of the bag to be challenging. The biggest challenge was with the instructions. It's not that the bag is difficult to make. It isn't. It's a pretty simple bag, but the optional bits (pockets and/or strap) made the pattern feel cluttered. There were several times that I actually said "huh? what?" out loud. Another challenge was the intentional vagueness of the materials requirements. It lists "medium/heavy weight fusible/sew-in interfacing." That's an awfully large range. I did email Reene and ask what she used, and she told me that she has done a variety of weights with her fave being Vilene F220/304 (it appears to be comparable with Pellon ES114). I admit that I like having choices, but not having seen the Doris project bag in person prior to making it, I didn't know how it was intended to feel. In the end, I did pick a different interfacing, but I felt good with my choice because it was an informed decision (keep reading to find out what I picked). This should come as no surprise, but I did make several changes to the pattern. The biggest change that I made was with my interfacing. The pattern leaves room for a huge variety of different interfacing types to be used based on how you want your bag to feel. 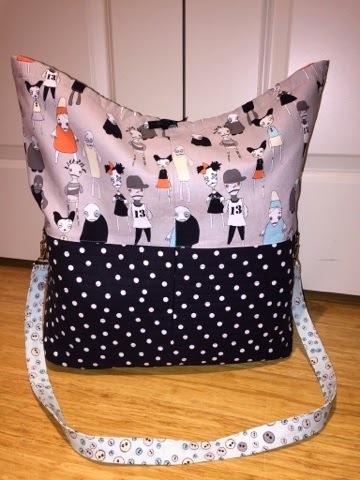 I opted to interface all exterior pieces of the entire bag with Pellon SF101 (Shape-Flex), and I used some scrap Quilter's Dream Poly batting to add some structure to the bottom of the bag. I quilted horizontal lines 1/2" apart to anchor the batting to the interfaced quilting cotton. I picked SF101 because I wanted the fabric to have some extra body without the crispness of something like Pellon 911F. The combination of Shape-Flex and Dream Poly batting made it feel more like Pellon 971 (Thermolam Plus fusible interfacing). My choice was really a departure from the instructions because the top of the bag in the pattern isn't interfaced. Another change that I made was in the tabs that attach the strap to the bag. The strap itself finishes at 1", but the strap tabs were only 1/2" wide. With the swivel hook and d-ring that the pattern specifies, I didn't like that the d-ring side was much more narrow because the hardware wouldn't have a lot of support (plus, I tend to prefer symmetry). So, I adjusted the cut piece from 2" wide to 4" wide so it would match the finished strap width. My other change was to increase the size of the hole used for turning the bag. The pattern calls for a 3" hole. That just seemed way too small, so I increased it to 5". It was significantly more easy to turn. This is why I need a project bag! So, would I make this bag again? Yes, and I think I'd probably make pretty much the same modifications. I'd probably stop the interfacing of the upper exterior a few inches below the top edge because the interfacing makes it a little more difficult to cinch closed. Well, that's about it for me. I've got another project to tackle before I can even think about my Space Dust quilt, but when I'm ready, I know that I can count on Doris to keep me in check. Look like a fun bag to make!